King of Cups shares emotional loyalty – unconditional love and commitment – the ability to give emotional comfort, support and positive regard to others. Qualities of generosity, reliability, respect – one who provides wise counseling with much empathy. A quiet spirit, filled with love that has moved beyond “ego” and vanity and offers unconditional spiritual healing and uplifting. Your happiness is the key to being alive. Laugh, love, smile and bring pleasure to your life. Regenerate yourself and you regenerate and heal others. Achievements derived from your creativity – shape life in a way that separates you from your playful imagination. To achieve success, you discipline and even suppressed your dreams – directing all your creative powers into socially responsible achievements and confining your natural energy flow. Always trying to maintain a calm exterior may cause you to subconsciously suppress your feelings and troubled emotions. Balance of your imagination and discipline is essential now – lighten up and have some fun. Healer by example and by touch. Faith is love, centered on the one God. What feelings are you keeping under firm control? In what ways are you a care – giver or counselor? Who cares for you deeply? How have you established yourself creatively? In the first position: You will be looked to for your authority and position, but more so for your compassionate use of your position. It falls to you to show that people may need leaders and organization to avoid chaos and work efficiently, but they do not need anyone to make them work or do anything for that matter. You seek to motivate by example. In the second position: You have someone – a family member, a partner, an angel – that you can fall back on. But more than financial or physical help, this is the strong shoulder to cry on, the caring ear that can listen to your problems. This man can help heal your wounds. 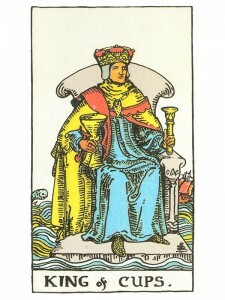 In the third position: Think well on this card for he is coming to you in one guise or another. For there is order to be put in your emotional/creative house, to take charge and make things right. More leadership and control is needed here. In the fourth position: Your earliest tapes of imprint are of this loving father figure, perhaps your own father. But it could be of an older family figure such as a grandfather or of course someone outside of the family, perhaps someone famous whom you came to admire. In the fifth position: The mind is on this king of the emotions. He may be a key player in the game on your table. You are being both authoritative and considerate in this matter. In the sixth position: Here comes a mature masculine influence in your near future and of course it may be delivered in person. As a result you will be more focused and purposeful in your emotional affairs and your creative projects can flourish with such motivation and encouragement behind them. In the seventh position: Here on the mental horizon in the near future comes power with a heart. This can be the partner you have needed to help you realize your goals. For with the intellect here are the personality and people skills to work miracles. In the eighth position: This king may be on your doorstep. He brings the possibilities of good times and rejoicing as he shows you how to do your chores and have fun at the same time. In the ninth position: The heart is on this king of the emotions. He may be an object of your affection or the centerpiece of a creative project underway. In the tenth position: Here is the support, the energy and resources that you need to secure your Emotional/Creative plane and it may well come in the physical personage of the King of Cups. It may however, be the access to what he represents. You must be able to wear both masks of the theater in the Emotional Plane – the smile and the frown.